Please join us inside our heated Youngstown showroom to view and discuss our brand new J/70 and J/88 models. Take an up close look at our stock boats, enjoy some food and beverage, and talk amongst J/boat owners and friends. Also joining us will be expert racers and sailmakers from Ullman Sails and Haarstick Sailmakers. RCR staff from all of our locations will be onsite to offer helpful hints from their extensive experience sailing these two J/boats. This past Monday I picked up J/70 #499, which we sold into Rochester, from Rhode Island, one of the boat building capitals of the world. While here, I couldn't miss the chance to set up a factory tour. The group at CCF Composites in Bristol, RI were terrific. This plant builds the J/70, J/80 and J/111, all of which were at various stages of production. The plant now builds one J/88 per week. We have sold hull #11, 28, and 29, hull #27 will be our stock boat, and these boats will start to arrive in Youngstown and Buffalo in mid-April. RCR is committed to this boat through our demo program with our hull #2. We didn't receive our boat until July and even with the shortened season we still had success with the program. We will again ramp up our demo program for the upcoming season. 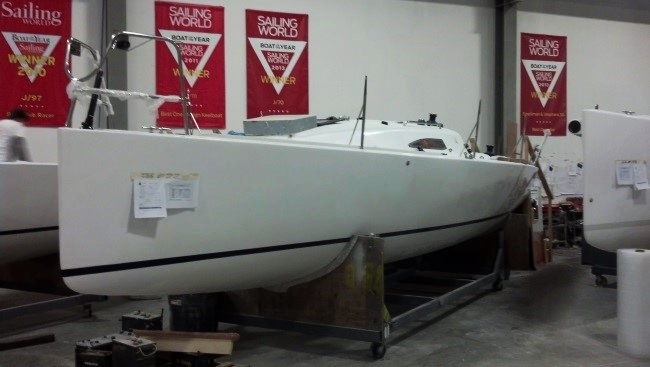 The boat will be raced as we expect to receive our PHRF rating this spring. We hope to have the boat sailing in our other locations besides Youngstown, which will provide additional sea trials to a larger group of sailors. Please feel free to give me a call to discuss the boat, I would be happy to answer any questions you might have. The boat now rests inside our heated showroom. Also come by during our J/Fest open house and meet some of the new J/88 owners and get their take on why they chose the J/88. J/88 is on the cover of latest Sailing World magazine, debuting SW’s new and improved format. J/88 Named Best Performance Boat under 40’ by Yachts & Yachting magazine!